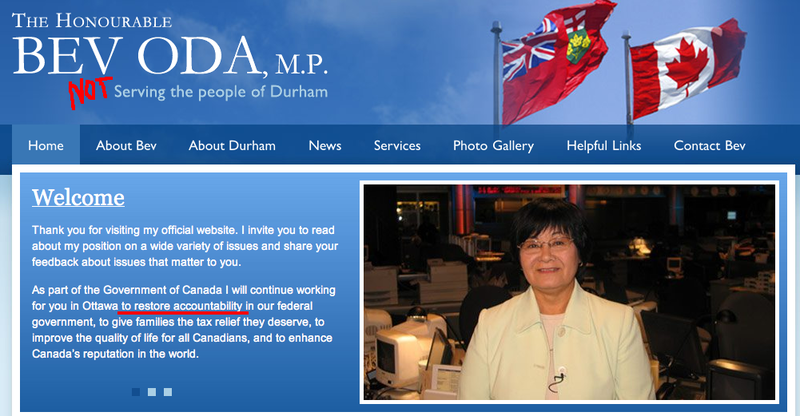 After QP yesterday, Bev Oda gave a bit of a non-apology apology for the “not” on the doctored KAIROS funding document. Saying that it was her decision and not a departmental one, Oda will only say that she directed the "not" to be put there because of the way it was worded, but not that she put it there herself. Incidentally, Oda indicated otherwise in committee before. Meanwhile, Glen Pearson reflects on what this all means for CIDA itself. But here’s the thing – we have a minister of the Crown who has now misled the house (no matter how she’s contradicted herself in her non-apology apology). She needs to be fired or resign (if she had any sense of decency when it comes to the integrity of parliamentary democracy in this country), but we all know that’s not going to happen. As for QP itself, it was largely leaderless as Harper, Ignatieff and Layton were all away. That left Ralph Goodale to kick off QP by asking about tax cuts versus home care (prompting John Baird to say the Liberals want to hike taxes), while Denis Coderre followed up by asking whether Kevin Page was right about deficit numbers. Gilles Duceppe asked about tax harmonization, and Daniel Paillé asked about the plans for a national securities regulator. Joe Comartin led off for the NDP asking about the TSX merger, which Tony Clement announced that he would be reviewing. Bob Rae kicked off round two by asking about the planned reductions in immigrant visas. He then brought up family reunification in the context of the Conservatives touting having family members look after children. (Predictably, Jason Kenney responded by obfuscating with numbers without context.) Marlene Jennings then brought up Kenney’s attack on the judiciary. Kenney responded with an attack on Jenning’s spouse, who is a member of the IRB, hinting that he let in terrorists and criminals. (It was klassy, let me tell you.) Carole Lavallée asked about that CRTC appointment (which we now know included an interview right in the Langevin Block, home of the PMO). Carole Freeman asked about the controversial reappointments to the board of Rights & Democracy, and Jean Dorion questioned about why Canada hasn’t yet frozen the assets of Tunisia’s ousted leader. (Apparently, the Tunisian government needs to make a request.) Larry Bagnell asked about the spiking prices of food in the North, and Frank Valeriote asked about the whole issue of the PMO trying to get Airbus 001 repainted due to presidential envy. Round three saw questions on whether Canada was indeed plotting to build ships jointly with the UK, the Quebec City arena, the KAIROS funding cut decision, antibiotics in supermarket chicken, veterans’ widows, Airbus 001’s paint scheme, and the cuts to Sisters in Spirit’s funding. Sartorially speaking, snaps go out to Marlene Jennings for her coarse brown and grey suit with a pink collared shirt, and Mario Silva for his impeccably tailored charcoal suit with a crisp white shirt and lavender tie. Style citations go out to Judy Foote for her terribly cut custard jacket over a black top, and Mike Lake for his black suit with a light custard shirt and brown tie. Also a warning to Lisa Raitt – turtlenecks are not your friend. Please avoid them in the future. After saying that all options are on the table for the 2016 census, the new chief statistician is terribly optimistic about just how well this year’s National Household Survey is going to turn out, and how there won’t be any real problems with the data because everything is just so hunky-dory. And a former chairperson of the CRTC has broken her silence on what she’s observed that this government has done with the arm’s-length agency, and her concerns that they are destroying due process when it comes to regulatory decisions in this country. It certainly gives one pause, but adds to all other abuses of the rule of law this government has demonstrated.